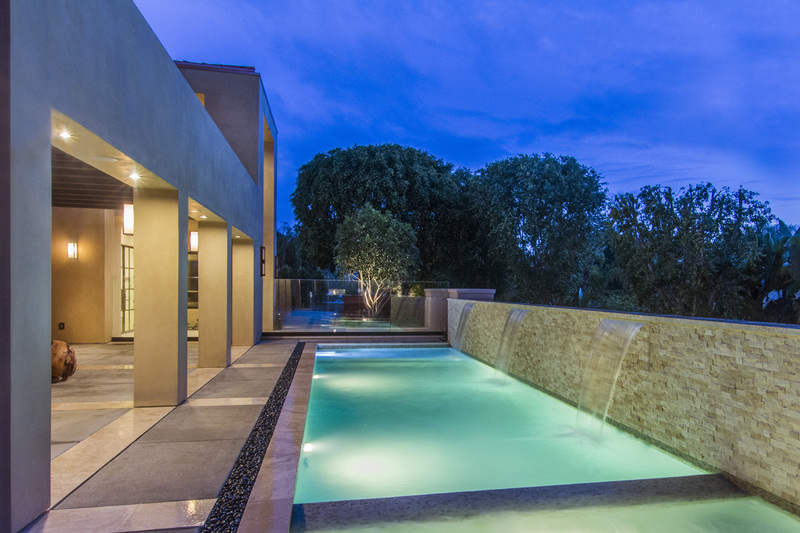 Step into the private courtyard with sparkling waterfalls and outdoor fire scenes. This brand new 2015 custom architecture by Marengo and Morton is truly the “Jewel of the Farms” A beautiful mix of warm, contemporary interiors and dramatic ocean view balconies are offered in one of the most desirable locations in La Jolla. Fleetwood 20′ sliding door systems open the great room to the entertainment pavilion. The master suite and spa is perfectly located on the first floor with private access to the courtyard and cabana. Four additional en-suite guest rooms, theater, gourmet kitchen with custom glass wine cellar and formal dining room with butlers pantry and outdoor dining courtyard complete this beautiful La Jolla Farms Estate.